Pavement ants (Tetramorium caespitum) are common household pests because they thrive in areas with a lot of humans, often living on or near pavement. Pavement ants will enter human houses in search of the sugary, starchy foods they love, potentially contaminating them with germs picked up from outside. Eggs – The eggs of the pavement ant are laid by the pavement ant queen within the colony, are small and white, and are rarely seen by humans. Juveniles – Within the colony, the eggs hatch, producing legless larvae that are fed on insect and fruit pulp until they pupate. The pupae form a casing around themselves and proceed to develop into full-grown pavement ants. Mature Bugs – Mature pavement ants are 3-4 mm long. 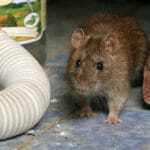 They can be anywhere from reddish brown to blackish brown in color, with paler legs and stingers. Queens and “alates,” or ants that fly to discover new colonies, are twice as long as the full-grown workers and have long, thin wings. Pavement ants like to live in close proximity to humans, who produce plenty of food scraps for them to eat. Their colonies are usually located underground or between walls. Due to their aggression, pavement ant colonies will be visible to humans, often attacking one another in large swarms. 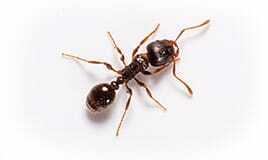 Sugary, starchy foods give ants energy and are sought out both indoors and outdoors. That said, pavement ants subsist mainly on grease, oil, and dead insects, and there are very few foods they will turn down. Pavement ant infestations are usually easy to recognize, characterized by trails and swarms of the ants inside your house and on your property. These ants are capable of stinging when threatened. These ants are difficult to remove, and there are usually more than one nest near a property, so sealing up their entranceways, closing off any potential food sources, and having a professional clear their nests may be necessary.